Humans -- particularly of the American variety -- will knock you for a loop now and then. They seem down; they seem out -- licked, run over, beaten to a pulp. Then lo! Then behold! 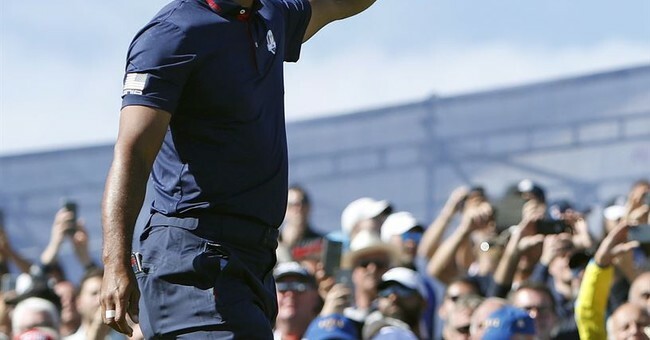 They pull off something big and improbable of who'd have-thunk-it dimensions -- just the way Tiger Woods did in Augusta, Georgia, to the world's ongoing, and well-merited, acclaim. You're never licked until you think you're licked -- and maybe not even then. That's our lesson for today, if not for the entirety of our time on the planet. It's a huge and timely lesson. And we shouldn't shrink from thanking two modern cultural encumbrances, big-time sports and big-time television, for conveying the message. A seemingly down-and-out champion, celebrated as maybe the best golfer ever (a bit of a stretch, I think), showed he wasn't by any means washed-up. No, sir! It was, for Woods, a matter of keeping on keeping on: working, working, working, trying, trying, trying. Victory ensued at last. Concerning Woods' Palm Sunday triumph, an exuberant newscaster used the word "redemption" -- giving the feat some unexpected theological coloration. Yet golf is the milieu Woods has chosen for the display of his abilities and ambitions. What he overcomes in the doing of his job and what strength of character he brings to the doing -- these are the relevant features in our narrative. Americans, it goes without saying, are good at starting all over again -- or once were, anyway. War and slavery split the country asunder and physically ruined an entire region. "Gone With the Wind" -- no sentimental paean to lost causes of any kind, never mind what nonreaders of the book might imagine -- magnifies the gumption and effrontery whereby Scarlett O'Hara and Rhett Butler, living up the track a piece from the future site of the Masters, survived and overcame. The Great Depression knocked Americans off their feet. They arose to rescue the world from dictatorship. In life, as my sainted mother was fond of observing, wryly, "It's just one 'D' thing after another." Accordingly, you take whatever it is and deal with it. It's the American way -- the Woods way. I never regarded Tiger, in his golf machine days, as made from the finest steel over forged. There is no way, nonetheless, not to recognize the steel as high-grade American. Woods strove, he worked, he fought for what he wasn't going to let someone else take from him. He kept a-comin'. Whoever runs this place after 2020, Americans of all stripes will do well to look around, consider the challenges and the materials at hand and get on with it -- no whining, no sniveling. It's not the end of the world to lose. It's the end of the world, surely, not to care.